Make PDF files for Printing Books on Press. A Visual Guide. 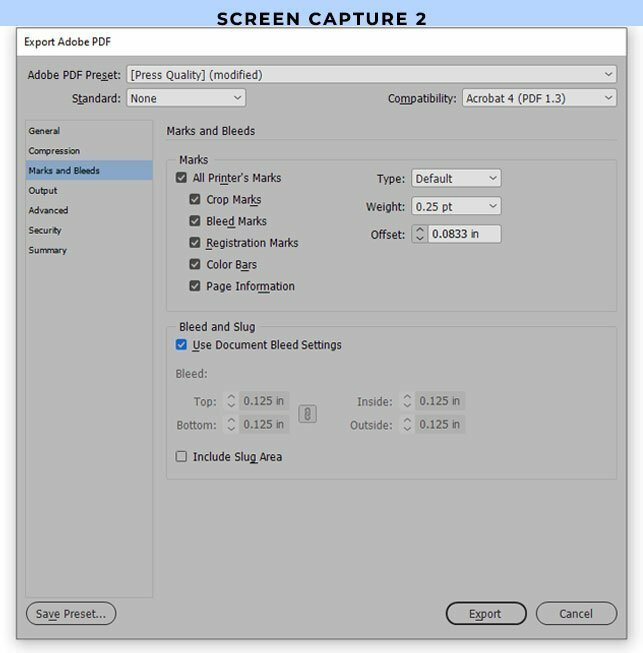 Helpful Hint 2: The crop marks, bleed marks, and printer’s marks are generated when you make PDF. They are not made in the InDesign file. 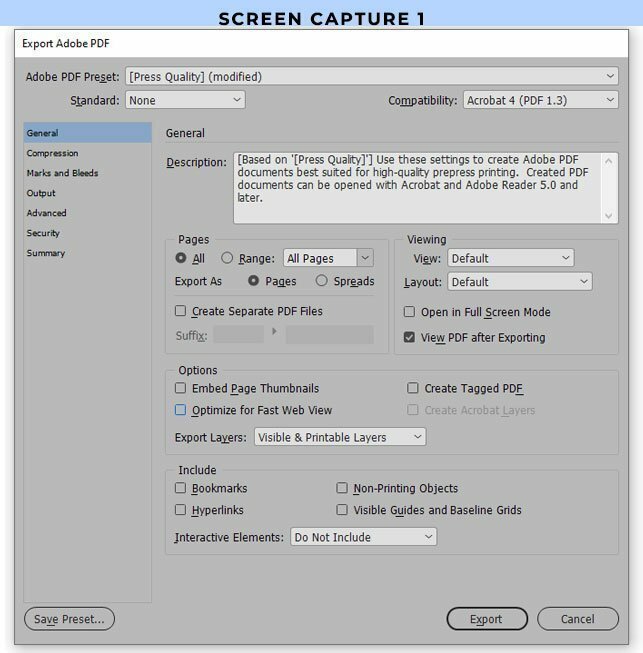 Make PDF files for book printing rather than sending InDesign files. The following is a reference guide to make PDF files to print books, specifically with Star Print Brokers. Please see the Prepress Guide and Send InDesign Files, to make sure the files are properly prepared. Most of the time we print from PDFs. However, there are times when InDesign files are needed. Printing from InDesign is the exception. Note about CMYK Conversion: Prior to generating a PDF, convert RGB images to CMYK in Photoshop. We don’t advise converting to CMYK when generating the PDF. This is because it is necessary to see how the images convert. Sometimes there is a shift in color. We prefer our clients see any color shift. Then, authors can adjust the color if needed instead of being surprised when they receive the physical proof. RGB has a much wider array than CMYK, but we use CMYK to print on press. IN PHOTOSHOP CC: Open all the links, either individually through InDesign, OR all of the images in Photoshop, in each folder where they reside. In the menu bar, select File > Convert to Profile. Select US Sheetfed Coated v2. This is the setting Star Print Brokers uses for process color images. Black and white images do not be converted. If you print with another provider, they might recommend another setting for their presses and paper stock. IN INDESIGN CC: Then, Update all links or Relink to folder in InDesign. Make PDF files now. InDesign: File > Export > Save (to desktop). 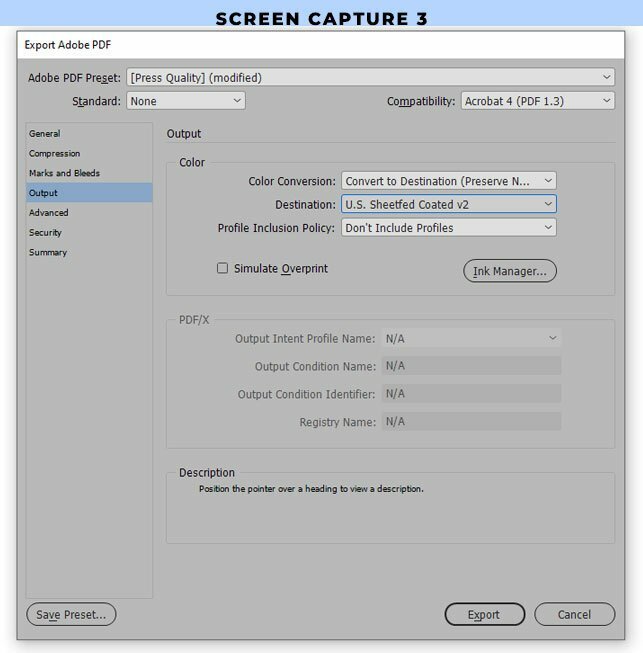 Adobe PDF Preset: You want to choose Press Quality because “Print Quality” is meant for output to desktop printers, not printing on press. Compatibility: Acrobat 4 (PDF 1.3). Once you select this option, Press Quality will become “Press Quality (modified)”. Acrobat 5 and higher contain functions we do not need to print on press, like preserving linkable text. These later versions can also interfere with imposition software printer’s use to prepare files for printing. Left column: Marks and Bleeds tab. Under “Marks”, check the box. All Printer’s Marks. Below that, check box: Use Document Bleed Settings. If you have set the bleed correctly in the Document Setup, you will see 0.125 in each box. It is okay to have the inside box set to zero. Left column: Output tab. They are the default settings. If you no longer have default settings, please use the following. Color Conversion: Select “Convert to Destination (Preserve Numbers)”. Profile Inclusion Policy: Select “Don’t Include Profiles”. Now click “Export” to make PDF files. Your PDF will automatically open. The PDF files may be on CDs or a DVD. More often, PDFs are placed on our FTP site, or uploaded to DropBox. Contact us for FTP info and password. Smaller PDFs can be emailed. Print-outs (optional). Include one set with color as you wish to appear in your book. This is not needed for a novel without color, but is necessary if color is critical. Submission form (optional). We will contact you if there is a problem with your files. But reviewing the Submission Form is a good idea if troubleshooting your files. After handing off the PDFs to Star Print Brokers, you will receive physical, full color, proofs. You will sign-off on the proofs as accepted to proceed with printing, or make changes. Use the book proof approval form. We also include it with the proof set and / or email. You may email it back to us, or fax it to (425) 603-0859. The set of physical digital proofs is for approval of approximate color and book pagination. They are often output on an top-level Epson, Duotech, or Indigo. While we accept corrections for typographical errors, we expect that the proofing and editing is completed before you give us the files. These are printing proofs, not graphic design or editing proofs. Press proofs are also available at extra cost. Call (844) 603-1777 toll-free, or (425) 603-1777. Let us know if you need anything else to make PDF files.